If you want to hide from your friends or your housewife to directly view your private files like photos or videos from your gallery, you can do this. Its very simple and easy. But it only hide from gallery, not in your file explorer. You can do this to make timeless to accessing your private photos or videos. 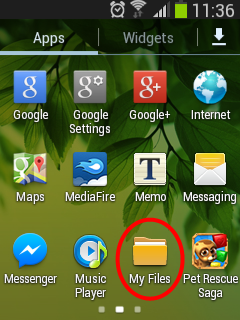 First you just enter your file explorer in your android phone. Open 'My Files'. Then you can choose 'extSdCard' to save your private files into External SdCard or you can choose sdcard0 to save your private files into phone's memory. And then tap on Option button and select 'Create Folder'. Then just move your files into that folder.